The team is proud to announce the release of LMDE 2 “Betsy” MATE RC. Previous Previous post: LMDE 2 “Betsy” Cinnamon RC released! Oh yeah! This is exciting! 🙂 Congratulations to Clem and the rest of the team! I’ll take a look at it soon. Re-iterating the question from the Cinnamon RC announcement: is an upgrade path from Update Pack 8 to be expected or will a fresh install be required? Edit by Clem: An upgrade path is planned but post-stable release. It’s also likely to be done via command-line. is it possible to upgrade current lmde to betsy? if yes, how? Hello Clem and team, I tried to install the new LMDE 2 Betsy Mate RC two times. The installer is very fast and straightforward. But at the first attempt, it could not format /dev/sdb3 with ext4. I waited 15 minutes while the installer said it is in the process of formatting the volume. But it never finished. I then aborted the installer, formatted the volume with Gparted, and started the Betsy installer again. It then formatted /dev/sdb3 in a few seconds and proceeded without any issue. Have had Betsy up and running since yesterday evening. Very nice so far. Will be giving it a good test today. Only thing I’ve noted so far is that my pop up notifications revert back from coco to the standard theme at each new boot. No biggie. I have the same quirk often with LM 13. Whatever, we’ll test the big stuff today. Thanks for the hard work you all have given once again. The Screenlets program doesn’t install a dependancy so it fails to run. I found out it was “python-gnomekeyring” or something like that which was missing. The same bug was in LMDE 1 by the way. Can confirm Rufus issue with Cinnamon: Installation fails on a sda3 partition with Precise. I needed to format the partition and restart the installer. Edit by Clem: Hi, please paste the output of “sudo live-installer”. is there a xfce version planned? Clem and team are going to deliver a Jessie release before Debian?! Hot dog! Nice work!! #7 @Guilherme I would like an XFCE version as well (perhaps XFCE 4.12?) although I doubt Clem and the Mint team have plans for XFCE, however, SolydX is also very good (and is [every bit as] good as LMDE in terms of usability and polish.) I think it began as a fork of LMDE, even uses [essentially] the same installer. But being able to stay within the Mint Ecosystem would be a huge benefit! Good news. Congratulations to Clem and all team. Greetings. FYI, after installing LMDE2 MATE 32bit, clicking on the “Important Information” link on the welcome screen opens http://www.linuxmint.com/rel_betsy_mate.php with a 404 Not Found error. Been waiting a while to try this. Thx. Will advise other issues as found. WARNING: Partition /dev/sda-1 or type 4 failed to mount! Edit by Clem: Thanks. Can you give us more info on your HDD and partitions? Is it a BIOS or GPT partition table? Can you list the partitions with it (for instance if it’s BIOS with “sudo fdisk -l”). cuanto tiempo esperando…porfin!!!! esperando aun a la edicion cinnamon!!! grande trabajo de este equipo!!! During the install no option is given to create an encrypted LMDE environment. Why not? This is a necessity nowadays if you are on the road a lot. Please add this to the install routine. Edit by Clem: Encrypted home directories are planned for a future release. Edit by Clem: Hi David, no. I have tried to run live DVDs for LMDE-2 on my ageing Mesh 64 3000. I have 2.5 GByte memory and an NVIDIA NV35 graphics. I tried the 64-bit options for MATE and cinnamon. I can boot only to a black screen and non-functioning keyboard. No go. LMDE-1 booted OK, and so does Debian 8 beta. I have not tried Debian 8 RC yet. For every-day use, I’m using Debian 7.8 MATE. Void Cinnamon 64-bit as of 10-Mar-2015. Edit by Clem: Try to remove “quiet splash” from the boot arguments. Alternatively try to boot with the “nomodeset” argument. why not? i mean you dropped lxde. Edit by Clem: We focus on what people want most. There are many DEs out there and that’s great, but we can only support a few as default. i used lxde when it came linux mint but when it was dropped i had to move to wattos or lubuntu but even with lubuntu it has become a bit bloated not to mention there moving to lxqt which is even heavier. My LMDE 2 Mate install went super smooth. The installer is still very good, a bit better graphics I think. Clem: My only request… it would sure be nice to see and edit the partition labels. an Elegant touch would be to default the names to the name of the distro and the type of partition… such as LMDE2RC.root and LMDE2RC.home. I installed LMDE2 Mate as dual Boot with Rebecca Cinnamon. I shared the home. The install when very smooth, no problems. The gpart tool worked great to grab another partition on the SSD. The desktop looked very familiar (although mate) and I realized that was because I had mounted the same home. All the plug ins I had installed on Rebecca Firefox were right there on Betsy. That was great to see. Everything seemed working as expected, Firefox seemed a little faster. Another great job. The installation has failed on my old Ibm Thinkpad, which was perfectly running the previous LMDE. I will make a couple of more attempts, just in case that was a little “hiccup”. Otherwise, I will wait a few days, hoping that trouble would be corrected. Edit by Clem: Hi, please describe what happens exactly. The output you pasted is pretty normal (these are only warnings and they’re quite common). Just installed LMDE2rc-64, tried to create a new panel, screen freezes although mouse still moves – nothing works after that. Turn off system and reboot yields black screen with moving mouse but no panel, icons or functionality. Edit by Clem: I can’t reproduce this issue. Can you check .xsession-errors for relevant errors? Try to run a different session (install openbox for instance) and from there, try to run MATE components one by one from the command line to see what fails and why… “mate-panel –replace”, “marco –replace” etc.. Thanks Cleam and Team For Hard Work to made Long Time Need Denian Distro. Where we find all Packs and used for Disk Version? I Mean the last Linux Kernel 3.19.2 Stable do you think use or made with old Kernel? When you made final all be back. Why you Removed Instalation for Windows i mean MintForWin? I Houp final version is clear adn working fine with all computers adn notebooks. Edit by Clem: Hi, I didn’t understand all the questions. We discontinued mint4win because it was very costly to maintain (not so much the source code, but it was making tests/QA that much more difficult) and it had a memory issue with large ISO files. Also there were alternatives for Windows users who weren’t ready to dive into Linux yet, such as virtualization. Edit by Clem: Ah.. there’s some GPT in there. Can you “apt install gdisk”, and then paste the gdisk output for each device? (i.e. “sudo gdisk -l /dev/sda”, “sudo gdisk -l /dev/sdb”, “sudo gdisk -l /dev/sdc”). Finally, are you running in BIOS or EFI mode? If you’re not sure, please do “sudo modprobe efivars >/dev/null 2>&1” and check to see if /proc/efi and/or /sys/firmware/efi exist. V. impressed, thanks. Runs well. Now if only I could get MythTV to run, but this seems to be a MythTV problem, not a Mint specific problem. Thank you, Clem! LMDE MATE is my favorite by leaps and bounds. You are an absolute hero. However the touchpad is not working. LMDE 2, I have installed the nvidia drivers in the repositories and it locks up on reboot every time. I have installed it 5 times and the same results. So I have uninstalled LMDE2. Edit by Clem: I’d need more info to troubleshoot this.. how it locks up, what dmesg says etc..
Clem “sudo modprobe efivars >/dev/null 2>&1” gave me no output. I only seem to have this problem with Debian distros (LMDE, Sparky Linux, etc. No problem installing Linux Mint 17 or any other Ubuntu distro. Able to repeat freeze on creating new panel (right click on the panel at bottom of screen, choose new panel ->> movable mouse but all icons and menus non functional). This fails with both 32 and 64 bit install, I have an NVidia dual monitor using nouveau driver. (USB tested fine for integrity prior to install). I have used LMDE on all my laptops i’m a novice user and have not had any real issues, i’m not sure why lmde is billed as hard to use i find it easy and the few times i’ve needed a fix its easy to find. personally i wouldn’t want Ubuntu on my laptop so Love LMDE. clem: The installation aborts just after enter my personal user and machine info. When I click on the next button, it exits. Unfortunately, I can’t reproduce it now, since I’m at my job. Tonight, I will retry, and transmit the error message. (I couldn’t copy and paste it, and was sure that the “sudo live installer” would do the job on telling you what was wrong. En passant, vous faites un boulot colossal!!! Merci!! Yes that is what I get too. I enter my language, location, keyboard, and all is fine. Then it asks for my name and password, auto login and so forth. When I click next it hangs up. It just sits there forever until I kill it. Previous post disappeared for unknown reasons. First VM install by ‘indirect means’ went fine. I’m on a slower Internet connection, so I started the install with a Debian Jessie netinstaller, changed the repos and voila! Looks good so far. IMO this points out the need for a Mint netinstaller. The Debian one is a good model (more drivers than the Ubuntu ‘mini’) and saves some time. It could prompt for supported DE desired and minimal or full application suite. Finally a minor ‘nit’ – the package ‘mint-stylish-addon’ is still broken. Please upgrade or kill it! So I got Betsy to install by unplugging my Windows 8.1 SSD. Apparently it didn’t like that drive. Think in the next few days I’m going to do some wiping all my drives clean and do a fresh install of Windows and MInt. One tip I found is that if your install hangs pull the plug on the computer until the light goes out on the MB. A “soft” restart doesn’t seem to do it on an installing of LM. Hi Clem. Everything worked out of the box. Great job. The touchpad, sound among them. I noticed a minor bug, reinstalling a theme gives error message “Can’t move directory over directory”. Will install again when directory is removed from ~/.themes. – Some people reported live-installer wasn’t able to format their partition.. we need more feedback to fix that. If you have any issue with the installer, please run it from the command line with “sudo live-installer” and paste the output for us. In this particular bug, we’d like to see the output of “mkfs.ext4 /dev/sdaX” for instance. It’s probably a trivial fix but we can’t fix it without that info. dear linux mint developers… i am a new user to linux overall…two months ago i discovered LMDE and believe now I can run it and be productive!! i have heard that you may give up LMDE in the future, because of the small user base…that would be the biggest mistake of your life…lmde has a small user because you don’t support it enough!! and not he opposite!! make lmde the default linux mint version (instead of the ubuntu based) and then lmde will have the lion’s share in linux mint users…if you don’t trust your product to make it the default installation, how would you expect from the users to adopt it as their first choice ????????????????? follow your own path na dnot just be a more beautiful ubuntu! Edit by Clem: It does. That’s what I thought was happening. Thanks a lot for that, we’ll get that fixed. By the way, the issue with unit_index = ‘BkMGTPEZY’.index(size[-1]) is already fixed if you upgrade live-installer to 2015.03.20 from the repositories. After upgrading, I opened a shell and typed “sudo live-installer” which worked nicely. Thanks for the very quick turnaround on this! 🙂 I finally found a distro to call mine!! oops.. did a mistake. The LMUE is XFCE. My old two installations are LMDE. Both Betsy now. Did upgrade the installer like instructed. Then I could pass through the installation. Currently running Betsy. Successfull install!!! Thank you!! Wifi stops gradually functionning after a while. The only way to get it back is to reboot. I hadn’t this problem in LMDE. My laptop is an IBM Thinkpad, with an integrated Intel Pro/Wireless 2200BG (Calexico2) Network controller. remark on comment 28: problem with elantech touchpad. This is not caused by the kernel (this version has support included). It appeared I had accidentally changed a parameter in the Bios: “Legacy USB Support”. It should be set to “disabled”. Now the system sees the touchpad again. The wifi indicator status bar goes intermittently from 100% to 0%. Sometimes, it gets stuck at 0%. Then’ I have to reboot to regain access to my network. I have another laptop that runs Rebecca, and it has no problem too. When I was in Live session, I never had problems. Just after installation, The update manager was indicating that there were updates availables. I have installed all of them. In Betsy Mate RC fstab does not automount the volumes I add. I use the same command as in previous LMDE versions, but the volumes do not show up. Any ideas? Do I have to create folders/mount points in the file system first? LMDE 2 Betsy installs perfectly on my Dell Vostro 17″ laptop – except for Ethernet. Wireless works perfectly. The wired connection works on the Live CD, but after installation, wired no longer works. It’s a Broadcom BCM4401-B0 100Base-TX bus-ID: 03:00.0. What did I miss? I connected my iPhone 6 to LMDE Betsy Mate RC. The file browser shows only one folder on the iPhone called “store_00010001”, but nothing else. The folder is empty. When I do the same on Linux Mint 17 Mate, I can see all photos and videos on the iPhone and copy them to my hard disk drive. How can I do the same in LMDE? Do I need a software package out of Synaptic? Sorry if I am posting this in the wrong thread. I could not post in LMDE thread. Greetings to Linux Mint community. Thank you all for the wonderful LMDE. I have been using a HP Pavilion 15-a026 laptop with LMDE (not dual boot) for the last one year. I could successfully update Linux Mint Debian using the update packs without difficulties when it was released. The processor is AMD A10 APU and has 8Gb RAM. Wi-fi is provided by Ralink RT3290 card. There are two GPUs. AMD Radeon 7660 (integrated) and AMD Radeon 8670 (discrete). I had got the switchable graphics card option working with fglrx drivers. But, I face a strange problem when i use the discrete GPU. When I select the discrete GPU and restart the system, i am not able to use wifi. The network monitor applet shows “Device not ready” under wireless option. When I restart with integrated GPU, the wifi works. I am clueless about this. Also when I try to switch on when the GPU is set to discrete, the boot process stops just before the login page and then starts again. The system reaches login screen only after two or more restarts. Could anyone please help me? How can I solve this issue? 32 and 64 bit torrents not working in UK. Downloaded the32bit http version from a mirror and burnt to USB. Quick message flashes upon boot ‘isoboot.bin missing’ then it fails to boot. Just tried it again (torrent) and at 18.10 hrs Sunday there is no activity. There a limit to how many times I can attempt to download a 1.5 GB file! Sometimes I loose the Wifi signal intermittently, sometimes I loose it for good and have to restart my IBM Thinkpad laptop. Also, I’m trying to install Betsy on an old P4 with 768 Meg of RAM, NVidia FX5200 graphic card. In live mode, the screen gets blank, after the logo. If I start in compatibility mode, I manage to have a working desktop, but I loose my ethernet by doing so. This machine works great in LMDE. Hi again, another small issue – not life-threatening or anything though: caja-dropbox does not display folder icons to indicate synchronisation status with Dropbox. Hi, I’m in the UK and the torrents and HTTP links are working fine for me. If you’re using a USB 3G dongle, that may be where your issue comes from – I get this on EE from time to time, this can also happen if you’re tethering from a phone; this happens regardless of OS and is entirely down to the network (sometimes they work, sometimes they don’t). My old Compaq Evo (768 meg – P4) that was running LMDE is finally OK with Betsy. I had to replace the Nvidia Geforce FX5200 graphic card by another Nvidia (FX-2, I think). After upgrading the live installer, I had no problem putting the OS on this old compusaurus. Now, it’s my third Linux-only machine. Thank you again for allowing us using this marvelous OS !! Which LMDE? MATE or Cinnamon? I’m using Mate. Cinnamon is for more recent and powerfull machines. Completed first week using LMDB2 Mate (amd64). No problems to report. Keep those updates coming! Toggling sound hardware config on MATE is not easy. Miss most of the first song to making the switch from internal analog to internal digital audio. For some reason it seems to default back to analog on reboot. Makes you appreciate Cinnamon. Humm, could just boot over to Rebecca but hey, LMDB2 has Cinnamon. The old Phennom X4 is just loafing on LMDB2 anyway. It’s great to have so many options! Can it get any better? Thank you for this. It seems to work well. upwards beyond the top of the screen. not everyone will have one handy. Edit by Clem: ALT+mouse_button allows you to drag windows (not only from their titlebar). Seems as though the B44 driver was blacklisted in the /etc/modprobe.d Broadcom file. I commented that out and wired works. Comment: This is a fantastic distro. I may switch from Mint 17.1 Xfce to Betsy on all 4 of my Vostro laptops. After the small hiccup above, everything has worked flawlessly. Hats off to Clem and the rest of the Team. I have a problem with LMDE2 Mate : the computer doesn’t power off after shutdown command. I have to maintain the power button to power off my computer. I have the same thing with Mint 17.1 Xfce. 63 structures occupying 1928 bytes. it runs perfectly on my lenovo thinkpad x250 but i had some issues during installation: 1. the live-installer wasn’t able to format the disk to ext4 -> had to do it manually with gparted (see rufus’ post). 2. the installer created only the user “root” – so i set up my user account with the command line tools after installation. One annoying bug: when installing, if you choose french keyboard in the first place, you can set up your full name/username with the french keyboard, but it goes back to english keyboard after setting a network name; and if you make a correction in username for instance, without looking carefully when typing, you enter some inconsistent data which prevent you from connecting after reset. Have installed on HP Pavilion dv6 Core i7-2670 Raedon HD7690M. I noticed that after installing netbeans followed by postgres/pgadmin, that the menu keeps losing the netbeans icon. The laptop seems to be running much cooler than it was with SL7 (RHEL7). sorry – I should have put this on the Cinnamon blog . My ethernet did not work after installing, but it did work on the Live USB. Same thing happened to me (see Msg 58). I solved it (see Msg 75). Problem is, once I comment out the B44 Broadcom driver, wireless stops working so it’s one or the other until I have time to figure out a solution so both work at the same time like LMDE 1 and Mint do. Hello to all Linux Mint team. I have downloaded and installed Linux Mint Betsy, in a notebook Acer aspire 5742, without any problem, it runs and works wonderfully, but i can not find the way to install programs as wine and google earth. ¿ Have i to wait some weeks until this distro be updated in order to install those packages? Please answer me. Congratulations for the great work you are doing for all who love Linux and the libre software. THANK YOU! Finally, a distribution that will install and run on my old AMD-powered HP laptop. I was really tired of using SLAX. LMDE runs newer packages? Seriously? Edit by Clem: Yes. Seriously. There’s 60,000+ packages out there, if you’re not sure how to compare their versions, we can compare a few for you. I’ve removed the parts of your comment which were offensive (it’s alright to be mistaken and opinionated, we all are at times, but please be more respectful). Have installed LMDE 2 MATE rc 64bit as VirtualBox instance. When selecting LibreOffice Start Center and then the Base Database, nothing happens. The libreoffice-base-core package is already installed, yet not sufficient. Resolution is to use Synaptic to manually install the libreoffice-base package from the repository. This was a problem in LM 17 MATE and LM 17.1 MATE. Is this an upstream issue? Am running LMDE MATE SP8 on 4 notebooks. Will update to LMDE 2 final be by Service Pack? LinuxMint is a tremendous distro that I recommend to all newcomers. Edit by Clem: Thanks Stan, we’ll have more details on that upgrade path after the stable release. Previously I had installed Linux Mint 17.1 xfce with the B43 driver and wifi ‘just worked’. That is… without needing to edit the blacklist file. either running from harddrive or from usbstick. On another machine that beep does not happen. I tried to mute all sounds, but still the beep. Any suggestions to stop the loud beep? When the final version of LMDE 2 Betsy comes out, will a fresh install be required or will all the applied updates make the RC exactly the same? In my opinion it would be better if the people would fix more bugs and problems – like the annoying not correct working x1250-driver – instead of thousands of different distros! Not a big deal but something I would like before the final release. I’ve been using 201403 LMDE MATE 32 bit and really like how when installing from the live usb method, that once installed you are prompted with this message: “Please remove the usb flashdrive and press enter”. Many distributions do not have this feature, which might put off the newbie (me included). That being said, this new LMDE 2 ‘Betsy’ MATE 32-bit that I just downloaded and installed via live usb, does NOT have the above mentioned feature. I really like the 140 background photo choices if wanting to customize the background, very nice indeed. I use ica client_13.1.0.285639_i386.deb to log into my company’s secure site currently on LMDE 201403, however this does NOT work in the 2015 version. This is a deal breaker for me so for now I have re-installed the older version, which I am very happy with. Thank you very much for all the work you have put into this new distribution. I have a problem in LMDE 2. 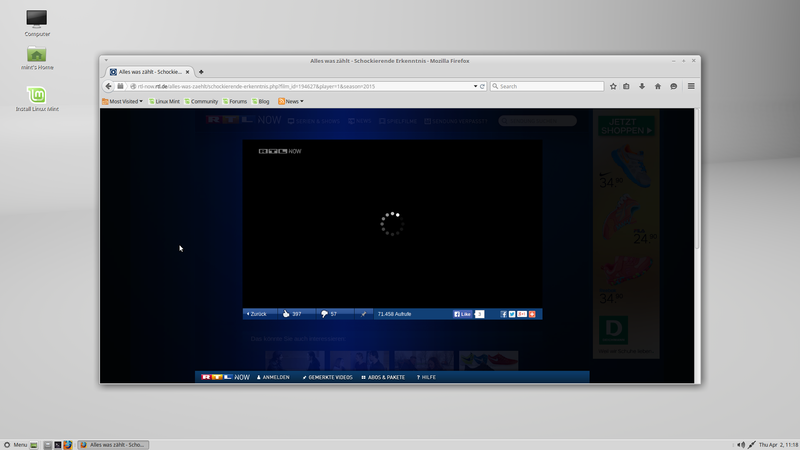 I open RTLNow.de or other sitzes of RTL. I will play a video, they have DRM. My problem ist, on all RTL site like RTLNow.de or RTL2Now.de etc. the videos are not working. The player is loading but no video starts. I see just a white circle. After I tried in Debian jessie too, the same thing. Ok, LMDE 2 is based on Jessie, of course the same thing must happened. So, I tried on the PC with Debian wheezy at home my parents, there is the flashplugin-nonfree 11.2.202.451installed, the newest Security version of flash. There the videos are working fine. Maybe is there on LMDE 2 / Jessie a bug into the system? Please you could help. Edit by Clem: Can you try and install “hal” into Betsy? or if you can’t manage, can you remove it from Wheezy and see if that breaks video playback? Afaik Flash DRM in Linux relies on hal.. which no longer exists. We can re-add it to Betsy though if you can confirm that fixes the issue for you. Clem, I found the reason, why you cannot browse the iOS (iPhone, iPod) file systems in LMDE 2 Betsy. The missing package is usbmuxd. Could you please add that package to LMDE 2 by default? Edit by Clem: Thanks Rufus, that’s really good feedback. Indeed, this is present in Mint and not in LMDE, I’ll add this to the roadmap. Hi Clem, thanks for your answer. I have tried to install hal of wheezy to lmde 2, but there are some dependence. So, i have a screenshot for you this shows the black window and the white circle. Now I am on a live session of LMDE 2. I looked in the synaptic on the computer of my parents debian wheezy, there are no hal installed. just the same like debian jessie and lmde 2 was. This bug have to be in other thing. Hal is not installed at wheezy. Thank you for including usbmuxd in LMDE. This thing was a tough nut to find out. I am really happy (I nearly gave up). Edit by Clem: Hi Rufus, more than that.. this led to postponing LMDE 2 by a week and taking time to evaluate the differences between Mint and LMDE. usbmuxd is just an example of that, thanks for highlighting it to us. We’ve 102 packages left on the radar, one of which is glx-alternative-mesa, potentially related to the Intel issues we’re hearing in our feedback. Keep up the good work! This thorough approach makes the difference. This is one reason why Linux Mint is such a good distribution. Therer is an issue with the installer as it went ahead and formatted my data drive, after double checking as usual that format was not selected. Not a happy bunny. Edit by Clem: Hi, I really hope this was a mistake on your side. Which partitions did the summary screen list for mounting and for formatting? Where did you “check” the fact that it wouldn’t format it? Was a mount point assigned for that partition? Do you have the output of the installer? Is it reproducible? Are we talking about the / partition here? or another partition with a mount point? or another partition with no mount point? According to https://help.ubuntu.com/community/RadeonDriver AMD/ATI’s RV350 and R420 are “Fully Supported. All these Radeon(HD) cards and derivatives have good 3D acceleration support” yet in order to prevent my PCs from locking up after the switch from the text mode boot messages (kernel boot options: ‘quiet’ removed & ‘nosplash’) to the graphical GUI desktop, I must use ‘nomodeset’ (Athlon XP with nForce2 Ultra 400 chipset). Why is that and what is the fix? – However having to use ‘nomodeset’ results in Totem, VLC & Banshee becoming unusable when playing video files (f.e. avi or mp4). They are causing a 100% system load and become extremely choppy or in the case of VLC, which doesn’t show any video at all, but is stuck with its very first frame, even though the elapsed time code and the progress bar indicate business as usual. On my old laptop (RS100 Radeon IGP320(M)), which does not require ‘nomodeset’, only VLC and Banshee (kinda) works (Totem is unbearable choppy). However VLC very frequently produces artifacts like these [img]http://i.imgur.com/qey0zJV.png[/img]. None of the media players had any of those issues with my previous vintage Mint 8 Helena. If I boot this laptop with ‘nomodeset’ for a test also, I am having the same issues as with the nForce2 based desktops. For all I can tell, those are terrible regressions from Helena, basically rendering most of my hardware unusable with the current releases. If anybody knows of any magic kernel boot parameters, which fix those problems, please speak up. – The ‘Character Map’ is missing in LM 17.1. Please add it again. I have now fixed my problem. You know, I cant install hal, it is just in the wheezy and sid repo. So, a good friend of mine was on debianforum.de and asked the Debian-User. 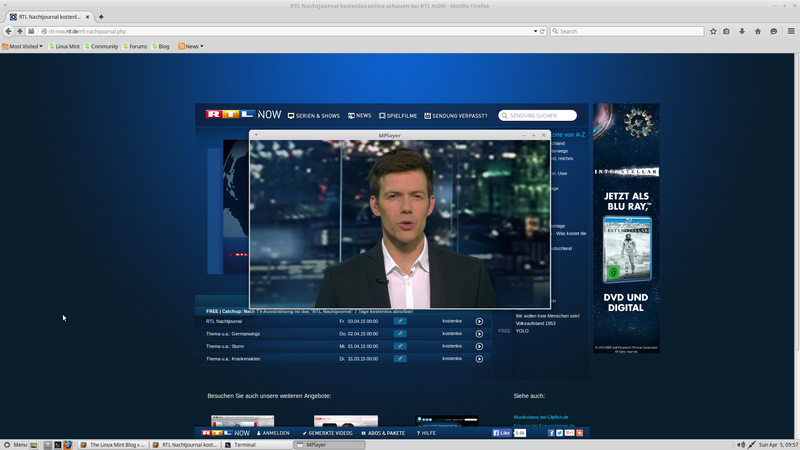 One person has had a great idea to watch the Videos on RTLNow.de without flash and this works on LMDE 2 great! The Link have to put between the " "
Hope I could other help with that. Watch now Screenshot. Hey THANKS Clem and ALL the Team! It works great. I had issues on first boot as i mounted my data partition and windows partition in my user directory. I altered betsy’s fstab from inside linux mint 17 and mounted them in home instead just to get the first boot. Updated and upgraded then changed the partitions to mount in the user directory and rebooted without a hitch. Got amd latest drivers running and all is ggod. I thought i wouldnt see another update to this loved debian distro. I really love the new installer! Looks so good! I saw you disabled the ppa’s in addapt-repository. No worries here, i got apt-fast running just the same. Sorry, I forgot to mention that I am using the Mate Live DVD of course, since Cinnamon still is unusable on my hardware. So why/how can the use of ‘nomodeset’ render all 3 media players virtually useless and what is the fix for it? – With Ubuntu claiming full Unity support for my video cards in the nForce2 based desktop machines, why do I need ‘nomodeset’ anyway to prevent hard freezes each and every time the GUI is supposed to start up? None of the other kernel parameters I know of besides nomodeset, prevent said hard freeze. Is nobody else operating any Athlon XP nForce2 machines with ATI AGP video cards anymore? And it slipped my mind to mention another major inconvenience and regression with VLC on my old laptop (RS100 Radeon IGP320(M)). Basically every other time when I use any of the Tools -> Preferences -> Hotkeys to perform a [very short|short|medium|long] [forward|backwards] jump, upon resuming playback the sound doesn’t come back. One has to repeat backward/forward jumps of different lengths often multiple (up to some 10) times, until audio eventually graciously decides to come back. Something I also never experienced with LM8 Helena. I even gave the latest VLC 2.2.0 a try, unfortunately with the same frustrating outcome. Haripal are you using smtp or imap? are you sure you have it enabled in your gmail settings? MATE-desktop 1.10 has been released. Will it become the default desktop for Betsy-2 Mate?